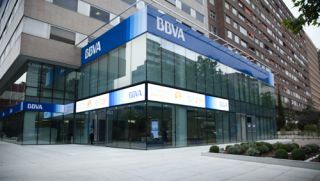 John Ryan has launched a multimedia signage system in BBVA's new Flagship branch in central Madrid featuring a 63-foot exterior LED, the largest of its kind in Spain. Playing a mix of headline news, weather and bank promotions, the exterior LED display is designed to turn standard static signage into a dynamic brand asset. Content is updated daily and focuses on inviting passersby to enter the branch and sample its new features. These include a series of touch screen kiosks and tablet devices, which are fully integrated with a queue and appointment management system. Other features of the Flagship location include self-service devices (known as "Abil") and collaborative client/employee stations. The LED, kiosks and media walls are powered by John Ryan's Messaging Manager digital signage platform, which also drive digital displays in other BBVA retail locations in Spain and Portugal.